Syndicated cartoonist, illustrator, author, nice guy. That’s the tagline for Jerry Craft’s website. Love that last part. Jerry is one of those special people who makes a difference wherever he goes. With more than a dozen books to his credit, he has made the dreams of many self-published authors come true. 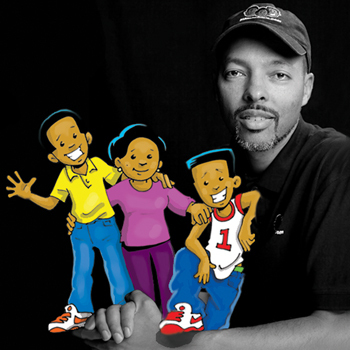 From alphabet book A is for Anacostia by Dr. Courtney Davis to empowering middle-grade novel Khalil’s Way by David Miller, Craft brings characters to life with his expressive and engaging art. Over the next few weeks, I put together a book featuring my best reprinted work along with brand new stories. Then proudly mailed off my submission to the publishers who specialized in that type of book. After a few weeks, I got my first reply. A rejection letter. Nothing at all personal. Nothing hopeful. Just rejection. A few weeks later, I got my second reply. Same thing. Well, they always say the third time’s a charm, so I excitedly opened the next letter. And it was … a rejection letter. BUT this one had a hand-written note. Finally, someone had taken the time to give me some feedback that I could use to get published. Although it was 17 years ago, I still remember reading, “We’re not interested in this ‘Good Times’ style of humor.” My smile turned to a frown, and then to whatever look you have when you’re a combination of angry and offended. The only thing that Mama’s Boyz had in common the TV sitcom Good Times was that it was about a Black family. While the TV Evans family lived in the projects and struggled to make ends meet, the Porter family in Mama’s Boyz owned their own bookstore. The mother loved to read. Tyrell and Yusuf are two brothers who did well in school and actually LIKE each other. Unlike the siblings on Good Times who did nothing but insult each other. Would this editor have also compared someone else’s comic strip to Gilligan’s Island just because the characters were white? I doubt it. That’s when I realized that whoever sent that letter, just did not get what I was trying to do. Nor did they want to. Nor did they care. So, instead of giving up, I used that note much the way athletes use things their opponents say about them, to get motivated. I went to the library to pick up a book on self-publishing, and six weeks later I sent off a digital file of Mama’s Boyz: As American as Sweet Potato Pie! to be printed. 2,500 copies to be exact. During the wait, I was able to use some great connections to get all kinds of press in some pretty big mainstream comic publications. I sat back and waited for the sales to come in. Then I got tired of sitting, so I laid down to wait. Then I went to sleep. I didn’t get a single order from ANY of that press. That was when I realized that the mainstream audience did not embrace my book, because I am not a mainstream cartoonist. Neither was Ray Billingsley, Morrie Turner, Brumsic Brandon, Stephen Bentley and the other black cartoonist who either didn’t have a book, or had one that was black and white and fit inside your pocket, as opposed to some of the full color books, in large format, and on glossy paper, that filled the shelves at bookstores. From that moment on, I never tried to reach out to an audience that wanted no part of me. Instead, I began going to local book fairs. At one of these fairs, I had a man ask if Mama’s Boyz was for kids. “Well, I guess it can be,” I remember answering. Although I didn’t do it for kids, there was nothing that was inappropriate. I still remember the kid going off to a corner of the fair and reading my book cover-to-cover and laughing hysterically. I had not made my market, my market made ME! During this time, I also had a full-time job, so I didn’t do nearly the amount of fairs that I do today. And before I knew it, 10 years had gone by. It was time to do another. So in 2007, I published Mama’s Boyz: Home Schoolin’. But this time I knew my audience was going to be kids and teens. I didn’t change the humor at all, but what I DID do to make it more kid friendly was add things like a flipbook, and a section on how to draw. This book sold even better than the first. Partly because I was better at selling, but also because I was able to get my first schools and libraries to buy them. One library bought 50 copies and gave to their kids. And not just African-American boys either. So for the first time I had girl readers as well as kids from various nationalities. Kids whose parents would have NEVER bought them my book. But luckily since the library GAVE them out, we were able to bypass the parents. And this new crop of readers LOVED the book. So much so, that when I did my third book a few years later, I added a few new characters to reflect my growing audience. 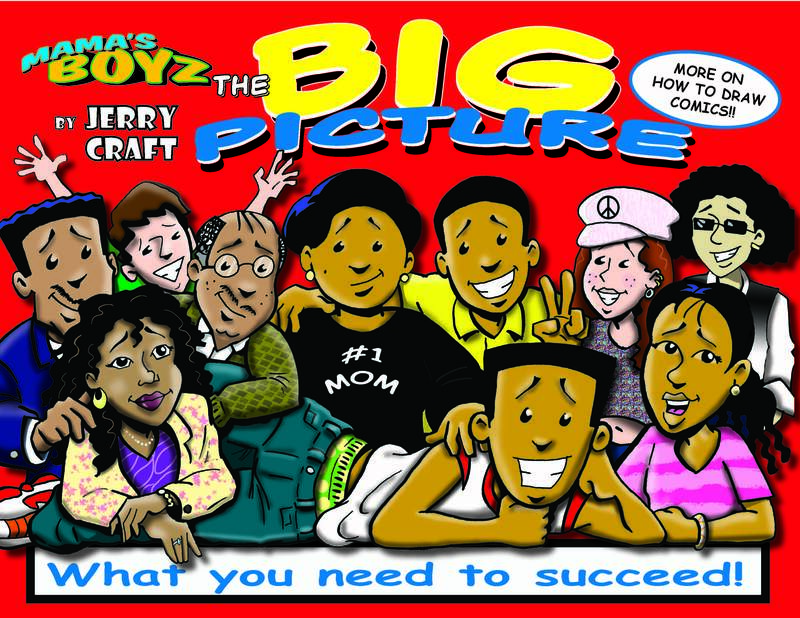 In fact, I didn’t realize until after Mama’s Boyz: The Big Picture had been printed, that all of the blurbs on the back cover were from female fans. Something I never had before. In fact, I’m currently redrawing the first book as a graphic novel that will feature some of the newer characters that weren’t in the first two books. It hasn’t been all fun and games though. More than 15 years later, I still need to find innovative ways to sell my book. For example, I know that my Mama’s Boyz books still will not sell outside of the African-American community UNLESS it’s a book fair where the kids have their own money. I can’t tell you how many times I’ve had to watch Billy’s mom take one of my books out of his hand, stroke his blonde hair and tell him that they, “needed to walk around first to see what else was there.” Then they spend the rest of the fair trying to redirect Billy’s desire to buy one of my books. They’ll spend $50 on cotton candy to keep from buying my $10 book. Mama’s Boyz will not turn your kids into gangstas! I’ve done studies! The other big hurdle is not having a close network of supporters. Meaning people I know. For example, if I could get 10% of my 4,000 followers on Facebook, Twitter and every other social media site to order one of my books in the first month of its release, I could immediately make back my print cost. It would also allow me to have to confidence to release more books that I think are necessary for our kids. 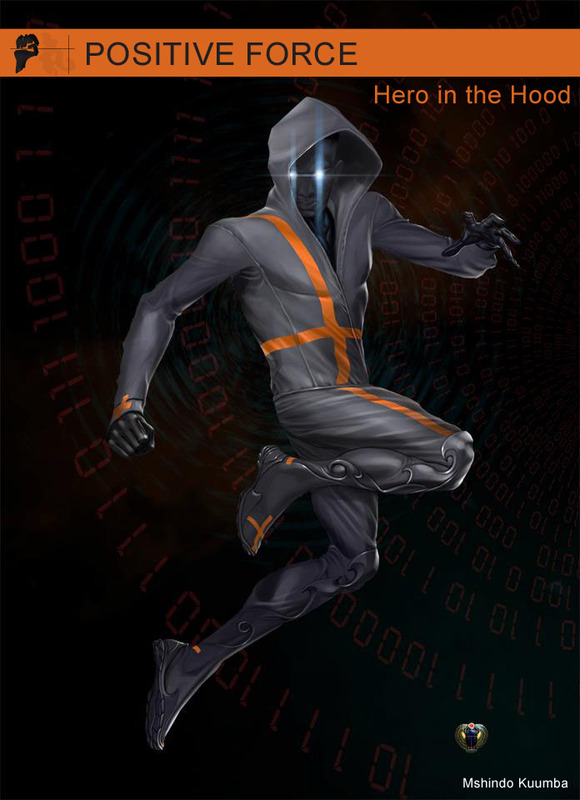 For example, one of the next books I hope to release is Positive Force, the story of a 16 year old superhero who fights crime in Harlem with the help of his father. Yes, a black teenage boy and his Father as crime fighters! But since this one is geared mainly towards black boys, I would need more than 200 people hitting the “like” button on Facebook, or telling me how important I am to the community but not actually purchasing a copy. So I’m still a little nervous. People forget that this is also a business. And like any business, if you don’t support it, it goes away. If you want your kids to read, and you think the books I do are important, than it seems like a natural fit. But often it doesn’t work out that way. 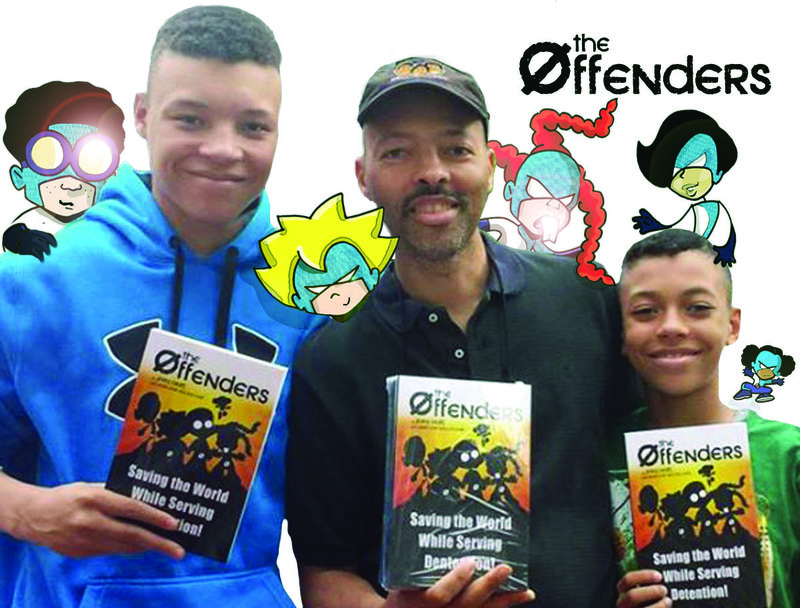 That was also why I moved up production of The Offenders: Saving the World While Serving Detention! which is the first of my books that I’m also shopping to publishers. It’s the story of five middle-grade kids who are the bullies of their school and are given superpowers. But instead of turning into really cool heroes, they take the characteristics of the kids that they pick on. So one gains 50 pounds, one gets super skinny, one get big metallic buck teeth (he teases kids with braces), one gets super smart but physically uncoordinated, and the last girl (who is always calling kids mousey) literally shrinks down to the size of a mouse. And the multicultural cast features three boys, (one black, one Korean and one Puerto Rican) and two girls as superheroes who have to save the school, even though they’re too embarrassed to go outside. Because now they’re the ones getting teased. I’m really proud of this book because of its anti-bullying message, multicultural cast AND boy and girl superheroes. And I did an enormous amount of research to write both the Korean and Puerto Rican characters. In addition, my two teenage sons, Jaylen and Aren are my co-writers! How cool is that. But again, one of the biggest problems I face is that instead of people writing about the book along with other books on bullying, I often have to wait until February to be featured in an article on Black History Month. And last but not least, I recently illustrated my first book for Scholastic called The Zero Degree Zombie Zone! written by Patrik Henry Bass that will be out this August. It’s one of the first books I’ve done that I have not published through Mama’s Boyz, Inc or helped an author to publish themselves. Thank you, Scholastic. So I guess I’ll see if people really DO want diverse books. If not, make sure to wave to me when you go to your local Wal-Mart. I’ll be the guy in the blue vest. To see samples of my work and see the books I’ve authored and or illustrated, check out my website at http://jerrycraft.net/. This is really great work, Jerry! You have been blessed and you never take it for granted. I’m glad to know you. Laughed when I first read that, then sobered… that’s really the bottom line, in a way. “This Book May Change Your Child Into X” is the fear that we don’t talk about, when we talk about changing the world and freeing up diverse books for publication. The fear can’t be addressed because they don’t even know that they have it. Have you thought of doing a “notebook novel” like the Wimpy Kid books? I would love to be able to find one of those with an African American main character. 6th grade boys can’t get enough of that style of book.